Dermal fillers can further improve your smile by reducing fine lines and wrinkles around the mouth. Facial expressions, sun exposure, lifestyle choices such as smoking, and facial structure changes due to the loss of teeth may cause the skin around your mouth to sag or become lax. You may also experience the formation of nasolabial folds, marionette lines, or other lines and wrinkles around the lips and mouth. To enhance your bright smile, we offer dermal fillers to create a younger-looking facial profile and compliment any new dental work that you may have had done. Dermal fillers are FDA-approved and use hyaluronic acid, a substance that is naturally produced by your body. Hyaluronic acid retains water, which is what gives your skin a firm, healthy appearance. As you age, your skin begins to lose hyaluronic acid, and unwanted wrinkles begin to show. Hyaluronic acid is what provides fullness and elasticity to your skin, keeping it youthful and firm. The hyaluronic acid in dermal fillers softens smile lines, crow’s feet, and other signs of aging to further compliment your smile. Dermal fillers are injected directly into the treatment areas. Most patients receive dermal fillers to correct moderate-to-severe facial wrinkles and folds between the brows as well as the lines between the nose and mouth. Some dermal fillers can also be used as a lip enhancer. A fine line and wrinkle treatment, dermal fillers are used to define the cheeks and brows. Nasolabial folds, marionette lines, and other wrinkles or lines around the mouth are filled with dermal filler injections, providing natural-looking results to help create a younger-looking appearance. Hyaluronic acid absorbs and retains water. Youthful skin contains a large amount of hyaluronic acid, keeping it smooth and retaining elasticity. As hyaluronic acid is lost, lines and wrinkles begin to form. Dermal fillers are scientifically designed to act like the hyaluronic acid in your body by volumizing superficial facial wrinkles and folds. Dermal fillers retain water to shape and fill smile lines, vertical lip lines, crow’s feet, marionette lines, and other facial wrinkles to restore the balance of hyaluronic acid for a youthful-looking appearance. Some dermal fillers integrate into the dermal tissue and attract and bind to water molecules. As the dermal filler is injected into your skin, it will add volume and smooth out unwanted wrinkles. By hydrating areas of your skin that have experienced a depletion of hyaluronic acid, dermal fillers can help firm your facial skin to reduce the signs of aging and create a youthful-looking smile. What can I expect during a dermal filler treatment? During your dermal filler procedure, our oral surgeons will carefully select the injection points based on your specific needs. Dermal filler injections may take around twenty to thirty minutes to complete, depending on the quantity of injections needed and what you are having treated. Our oral surgeons can determine the quantity of dermal filler injections needed in order to provide the most aesthetically pleasing results. Because dermal fillers are a non-surgical wrinkle treatment, most patients are able to return to work almost immediately. Some common side effects after receiving dermal fillers include slight redness, irritation, or swelling at the injection sites. These symptoms are temporary and will fade in the days following your dermal filler treatment. You will notice that facial lines and wrinkles will begin to soften and become less noticeable, with results continuing to develop in the days and weeks following your dermal filler procedure. Dermal filler results can last up to six months. Patients who receive dermal fillers in their lips may notice that their lips appear swollen or look asymmetrical immediately following treatment. These symptoms may persist for a few days but will gradually lessen in the days following your dermal filler injections. 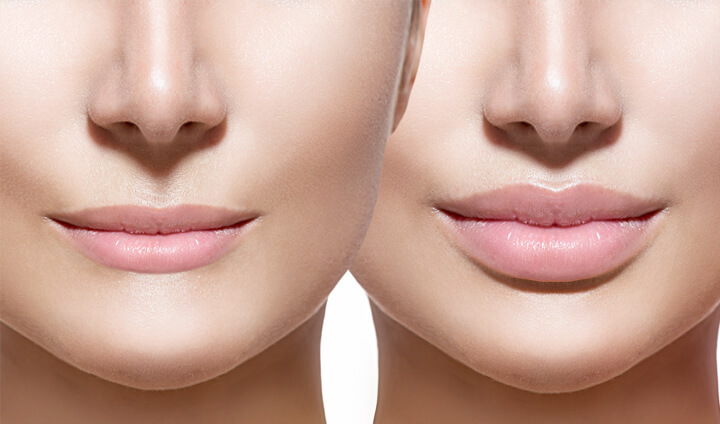 As you adjust to the dermal fillers and swelling subsides, your lips will appear fuller and plumper, while having the natural-looking appearance of your lips prior to lip injections. Ongoing dermal filler treatments are recommended every six to twelve months to maintain optimal results. Although very rare, if you are unhappy with your dermal filler results, our oral surgeons can administer an enzyme called hyaluronidase, which will completely process and reverse the effects of dermal fillers that are made of hyaluronic acid. Our highly skilled oral surgeons aim for pleasing, natural-looking results to ensure that you are happy with your dermal filler treatment. How can I find out more about dermal fillers? For more information on dermal fillers, please contact Staten Island Oral & Maxillofacial Surgery to schedule an appointment with oral and maxillofacial surgeons David Hoffman, D.D.S., F.A.C.S., Lydia J. Lam, D.D.S., Steve Yusupov, D.D.S., M.D., and Mark Stein, D.D.S., M.D. at 718.226.1251.